The South West Region Hasler preparation race (Class B) will be run to BC Hasler series rules. No Hasler or Lightening series points will be awarded so rankings will not be affected. CSCC (Long Close) is just off the A4 London Road, on the east side of Chippenham – follow signs for the Canoe Race car parking in the field adjacent to the club; courtesy of Chippenham Sea Cadets. Booking from 09:00. Individual booking is permitted. Club Team Leaders will be given priority. Lightning / Fun Race £4 per seat. 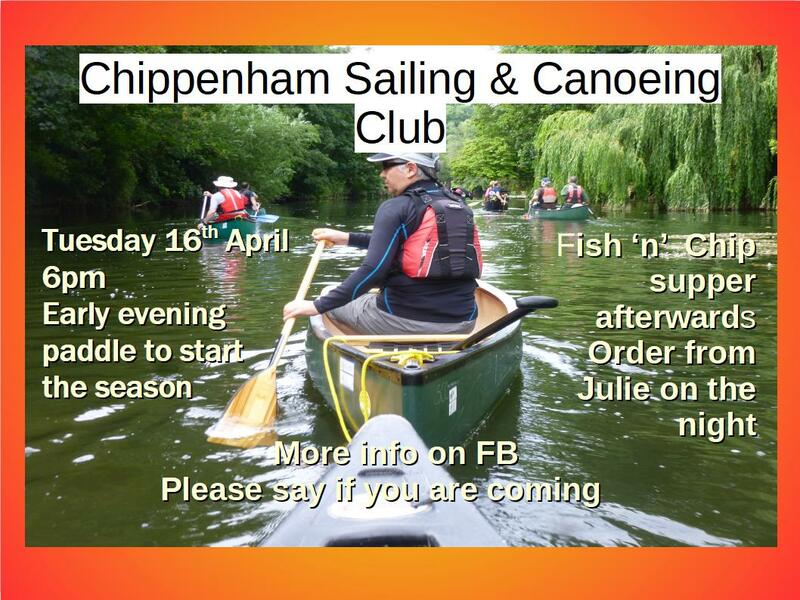 To be received by Friday 17th May at the latest, Payable to Devizes Canoe Club C/O Ann Slator, Devizes Canoe Club, 2 Forest Lane, Chippenham, Wiltshire, SN15 3QU. Bouyancy aids to be worn by all Division 7, 8, 9, 10, Lightning and Open class paddlers. Paddlers in the Lightning races must paddle Lightning’s and not any other type of craft. Toilets and showers are available. Hot and cold drinks and light refreshments available. Paddlers food inclusive in entry fee. A gentle get together paddle, to start the season off, for all abilities, juniors accompanied please. Arrive early to sort boats out and get on the water by 6.30. Followed by a fish and chip supper ordered in advance form the chippy, Julie will collect orders before we set off. Fish & chips for special deal £4.75 . An evening of learning a few basic knots and a social. Please bring a plate of party food, wine etc. Please contact Jane Allen via the contact form or Facebook. Numbers by 10th April Please. First come, first served basis. Get to know some new club members while improving your boating knowledge. First work day of the year, lots of jobs to tackle small and not so small. Tools are available but bring your own as well, there is always landscape clearing to do, loppers shears etc. and work gloves. A list will be published ASAP, if anyone thinks they can do a task in particular please put your name to it also bring any equipment needed. The club runs on volunteers, there are no paid workers, so all members have a responsibility to help however small a contribution. This adds up to a volunteer discount scheme giving a discount on the subsequent membership. 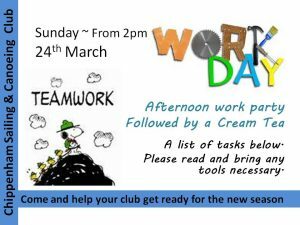 So that’s the serious bit, come along on Sunday if only for a short time, and there is always a cream tea, a chat, some other members to meet to look forward to. Contractors will be working on shed refurbishment, commencing Monday 7th January 2019. Do please be aware that access may be restricted to various parts of the club. You cooperation will be appreciated. This is short notice but after the success of Mark’s roast lunch recently we thought it would be great to repeat it while the weather is still warm. The RYA has put out a call to all clubs for members to take to their tenders and dinghies this weekend and have a shore and marina clean up, extending it to rivers as it all ends in the sea. This year has had a huge wake up call concerning rubbish in the sea, plastics in particular, we can do our bit in a small way. Hope to see lots join in, and Mark’s dinners are a must. ‘Tails of the Riverbank’ is the event postponed from 23rd. Aug.
All participants and families of the courses invited. 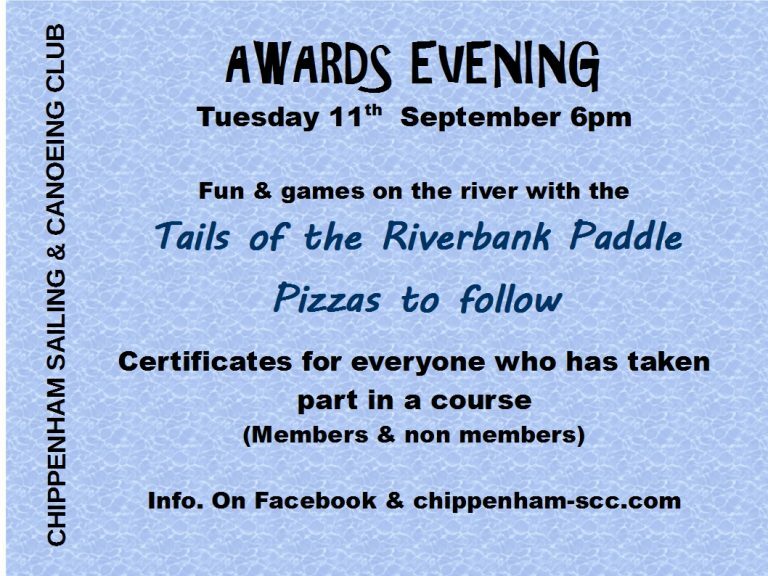 Thursday 23rd Aug 6pm –Tails of the River bank – Postponed until Tuesday 11th September! The SUPs will be unavailable for use on the 8th of September 2018.